Weight Watchers on Tuesday announced the latest celebrity to follow in the 20-pounds-lighter footsteps of Oprah Winfrey, Jennifer Hudson, and Dutchess of York Sarah Ferguson: DJ Khaled. “Who? Was he on Matlock? !” you shout into your partner’s hearing aid, puzzled, likely confused, possibly scared. Have no fear, this millennial will hold your hand and guide you through with a primer on one of music’s most famously rotund men. American popular music producer and record label executive DJ Khaled was born Khaled Mohamed Khaled in 1975. In the mid-2000s, Khaled rose to prominence in the rap music sphere as the DJ for Terror Squad, with a hand in such albums as Fabolous’ Real Talk, Terror Squad’s True Story, and Fat Joe’s Me, Myself, & I. He has since released ten studio albums. Note: He is not involved with any actual terror squads. Below is one of his songs. Click the white button with the triangle in the picture to play the song. You likely don’t recognize any of the young men in this video—Justin Bieber, Chance the Rapper—but your grandchildren think they’re the bee’s knees. Khaled is known for several calling cards, primarily the self-referential “DJ KHALED” with which he begins many of his songs. Khaled also frequently boasts of his discerning and indulgent palate, affirming his love for Belaire champagne, Arab food, and lavish dinners out. 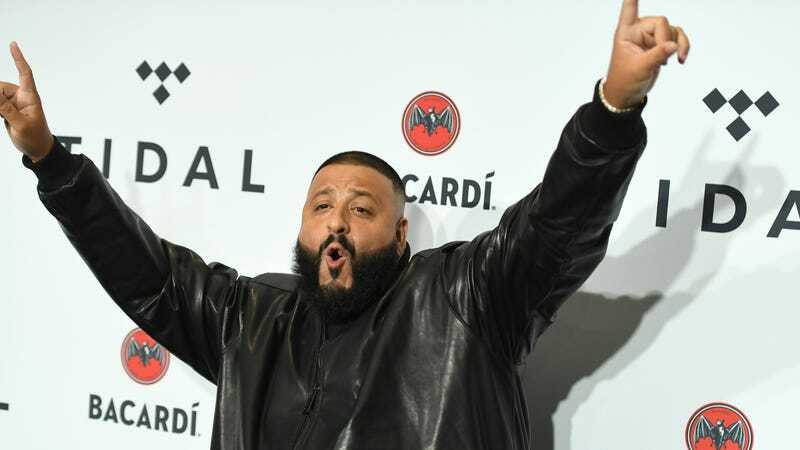 Khaled is popular on social media—yes, you can access this via America Online—where he has amassed nearly 9 million Instagram followers and is reported to garner millions of views for each of his Snaps (video updates on something called Snapchat). On Instagram and Snapchat, Khaled expounds on his philosophies and lifestyle, which commonly touch on themes of success, blessings, and overcoming obstacles to achieve his #wethebest goals. Khaled’s young son, Asahd Khaled, features prominently in many of DJ Khaled’s social media posts and has his own 1.7 million Instagram followers. DJ Khaled says Asahd has been a major motivation to join the Weight Watchers program, which has already contributed to the producer’s 20-pound weight loss. Recent Instagram videos show DJ Khaled enjoying noodles and counting his Weight Watchers points. Do not be scared of Khaled. He seems like a nice young man who just wants to fit into his trousers better.